Our Looking Glass Collection is a brand new line of pendant necklaces crafted with our exclusive Looking Glass Bars & Japanese chiyogami (old-paper). 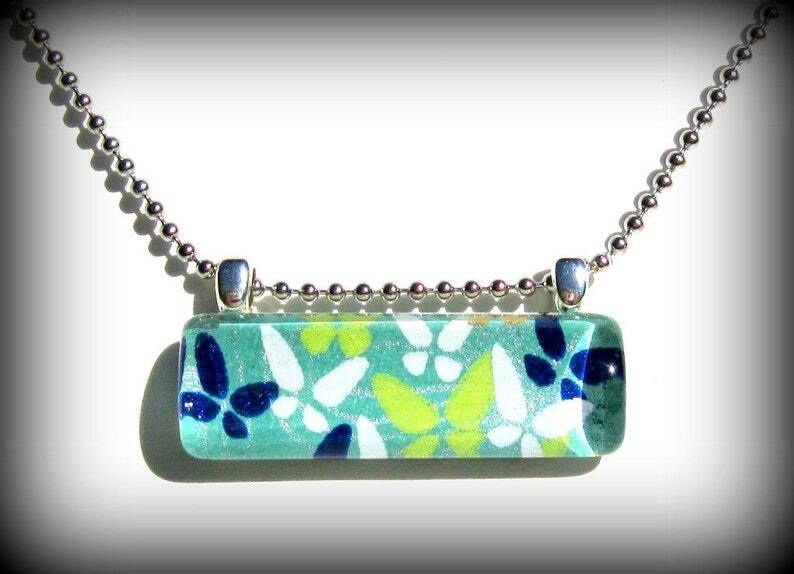 This Looking Glass necklace is in our "swing" style and features Japanese paper with an adorable flock of blue, lime green and white butterflies against an aqua background. ***Looking Glass Bars : dainty 13mm x 38mm x 7mm - this exclusive handcrafted glass richly magnifies the images offering amazing depth and reflection to the age old Japanese paper. It's sealed well to protect against water, oils and stain, however removing before showering/swimming is recommended. All Looking Glass Pendants come ready-to-wear with a FREE 18" steel ball chain and, like all GamiWorks Jewelry, each arrives beautifully packaged in a coordinating gift tin. Please note....every item is a one-of-a-kind and designs may vary slightly due the pattern of the paper. Engraved pendants may not be returned unless damaged. I lovingly make each piece out of my home and package well to ensure a safe journey to yours. Wholesale and Bulk orders welcome! ***All designs, images & content ©2007-2012 GamiWorks. Reproduction in whole or in ANY form without express written permission is prohibited.